I decided that for our Clemson Reunion in October I needed a really fun accessory without breaking the bank. I have seen these rolled rosettes all over the place. In fact they are also in the Burlap Wreath. So I made a rosette necklace :) I have also seen some that have a bunch more rosettes/embellishments called bib necklaces. Soooo... here is what I did. I found some cute orange polka dot fabric at Hob Lob and used a coupon. I just love polka dots... I mean what girl doesn't. I also grabbed some Liquid Stitch and felt and I already had some beads and ribbon. First you make however many rosettes you want on your necklace. Honestly there are a million tutorial in blogland on this so you could just google it. I cut my fabric strips around 1 1/2 inches going parallel to where they cut the fabric. Then I folded my strip in half the "hotdog" way and glued with Liquid stitch so no fabric underside was showing. Anchor one end with something (like an old check box) and twist the other end of the fabric until it is as twisted as you want. Then start rolling at that end while gluing with dabs of liquid stitch along the way. I have seen people use a hot glue gun too but I think this was better and spares burned fingers. Just keep gluing and rolling until your rosette is the desired size. I did 1 larger and 2 slightly smaller ones. I glued them with a glue gun onto felt exactly how I wanted them placed for the necklace. Then I trimmed the felt. Afterwards, I realized it would have been easier to cut the felt and then glue since I did not have the best pair of scissors and trimming took awhile. Next attach whatever ribbon you want with a glue gun. I added knots at each end and a matching bead for a little pizazz! Glue an identical piece of felt over your ribbon to hide it and for sturdiness. That completes the rosette necklace!! *This tutorial is for personal use only please. Looks great with your purple shirt! But I have an idea... maybe you could make one big rosette and 4 little ones, attach them off center and it would look like the clemson paw print...??? maybe??? or could you sort of make the "toes" oval? @Katie, haha that would be cute! This is super duper cute. But I fear if I tried to make one...it wouldn't look as good as yours. I'm daft when it comes to crafty things. Adorable! 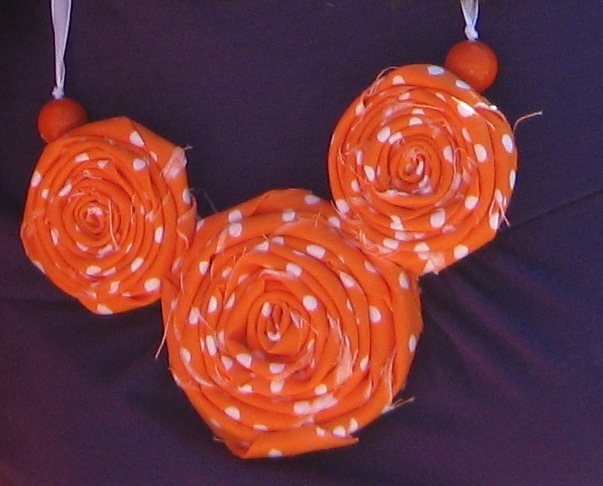 I made a similar rosette with black and orange polka dots for Halloween! I love this necklace. I'm thinkin it should go on my project to do list. Thanks for sharing! I have made these before, but I like how you twisted it all up first then rolled it. It seems much easier that way. I will try that tonight! Thanks so much! Beautiful! I'm blog hopping and found your blog. I'm a new follower. Would love for you to check out my blog and follow back! LOVE THIS! Such a cute blog- this is my first visit. I adore college football as well- this is such a festive thing to wear for gameday! too too cute girl! Love it! The orange is so fun! thanks for sharing this fab tutorial.